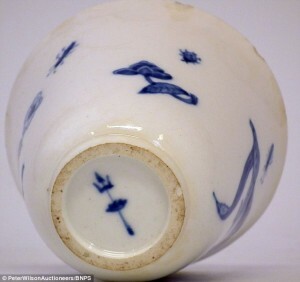 A man in the U.K. purchased a lot of Pottery for £100, unknowingly becoming the new owner of a piece of Chelsea porcelain in which there are only two in existence! What a surprise, when he put it up for sale at an auction and it sold for £45,000! This special piece was made 266 years ago, and bares a specific marking, the crown and trident, only found on 20 pieces of Chelsea porcelain. Next time you are at a garage sale or auction make sure you check out the porcelain section! 220 billion dollars was made from garage sales in glassware and dinnerware alone. Speaking of dinnerware, keep an eye out for all colors, shapes, sizes and materials. 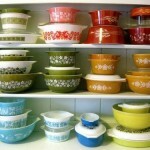 Vintage Pyrex goes for big bucks on Etsy and Ebay. Look for collections, because they sell for more. Jade-ite is a big seller as well. There is a 16-piece dishware set is going for $520 on Ebay right now. Anything that looks tarnished; cups, silverware, ect. could actually be real silver. And keep an eye out for anything with an iridescent patina. It is called carnival glass, and is highly collectible. But rule of thumb, just keep an eye out for any patterned glass. Any patterned translucent colored glass, you may have stumbled upon depression-era glassware. It could be crystal, and if it’s etched with the Waterford or Fostoria mark it is worth picking up. This is a lot of information to drop on you all at once about dinnerware! But if there is one thing you look for on a piece, turn it over and look for a stamp, marking, or signature. Just like this porcelain beaker, you could be holding a piece of £45,000 porcelain and not even know it. With 45,000 garage sales in America every weekend, it is a wonder there are so few headline success stories. If you are driven by saving a pretty penny or love the challenge of digging through bins to find that hidden treasure, I have some tips that will save you time and money. I have decades of first hand experience of how to break into that untapped market of hidden treasures. Step one: Have a plan. There are many apps out today that will assist you in planning your path. If you are strategic, you can hit one garage sale after another without making a wrong turn or going out of your way and wasting gas. Your Android options are limited Yard Sale Treasure Map, Garage Sale Rover, and Garage Sales, Everywhere!. If you have an iPhone you have significantly more options with Yard Sale Mapper, Garage Sale Wizards, Yardsale, and Private Garage Sale to name a few. These will keep you on track and give you new item alerts so you can fully meet your bargain hunting potential. Step two: This step takes a bit of homework. If you are planning on buying items that you can flip and sell quickly, know what you are looking for in advance. Know what name brands will sell and how to tell if they are fake or not. The best way to become what I call a “garage sale millionaire” is to become an expert on a handful of items, so when you come across those items, you know how much, if anything, they’re worth on the market. Another helpful tip if you are short on time is to use a reverse image search in Google. It will look up items that look similar to the object you are thinking about buying and pull up Ebay items of the same item. This is a great advantage to improve your treasure hunting experience! Step three: Become a real person to the seller before negotiating a price. Your goal is not to ask for such a low price that the seller is insulted. Ask for around 50% of what the item is priced at. But be strategic as to how you begin the conversation. Start off by chatting about the weather. Simple conversations go a long way and when people have time invested in you, they feel more obligated to give you a better deal. Follow these three steps and you will be on your way to a becoming the next great garage sale success story. Want to gain some more knowledge and helpful tips, check out The Garage Sale Millionaire Book. You can purchase it here!